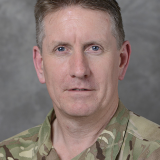 Chief Executive Officer Information Systems and Services, Lieutenant General Ivan Hooper, is responsible for delivery of all information capabilities for Defence. Pending the appointment of a Defence Chief Information Officer later this year he is in the interim responsible for the full breadth of the CIOs role and responsibilities. Previously ISS’ Director Service Operations, he was responsible for the operation and cyber defence of the MoD’s global communications network. He has commanded at every level up to and including Brigade and in a variety of operational theatres. He has been an instructor at the Royal Military Academy Sandhurst, the College of Management and Technology and the Joint Services Command and Staff College. His staff posts in acquisition have included roles in the MoD Capability Directorate and Defence Equipment and Support. He is an alumnus of the Major Projects Leadership Academy and has participated in reviews of a number of major Government projects outside the MoD. General Hooper is married to Helen and they have two teenage boys. He is a keen and active mountaineer, skier, and offshore sailor and is President of the Army Mountaineering Association and Commodore of R SIGNALS Yacht Club. He remains an optimistic supporter of Bath Rugby Club. Check out the incredible speaker line-up to see who will be joining Ivan .